Hacktools is Popular Youtube trending network that provides awesome and creative DIY Stuff,How to and Trending Experiment. 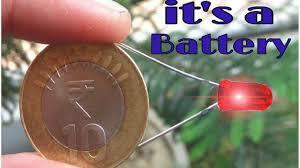 Firstly We need some copper coin depending upon your requirements of power you will use a copper coin(one coin produce 0.45 volt and here we use 15 coin which produces 6.75V which is sufficient to glow a LED bulb) Here we used 5 rupee Indian coins. Now take a piece of cardboard of good quality and put the coin onto the cardboard draw the outline and cut down by using a knife, depending upon the quantity of coin use for examples if you use 15 coins so you have to cut 15 pieces of cardboard of coin size. Now, similarly Also cut the piece of aluminum Foil like Cardboard. Now take the Vinegar (electrolyte) Put the piece of Cardboard which is been cut down early into the Vinegar for few seconds and then take out from it, Now take a copper coin put the Vinegar dipped cardboard piece onto the face of Coin and after that put the piece of Aluminium foil this procedure is repeated until the last coin. Now take Piece of wire and put them on the face of coin top and bottom to make terminal now connects it to the LED it will glow.